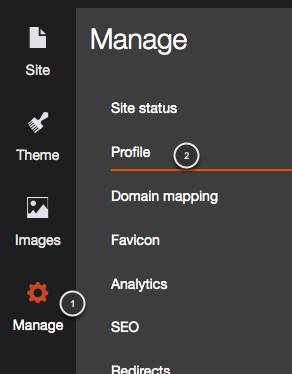 When you first create a website with the editor, it will offer the option to set your profile information. If you choose not to, you can later add it as shown below. The Profile and Contact details will help you setting up your site easily by placing your information where it belongs across your website. 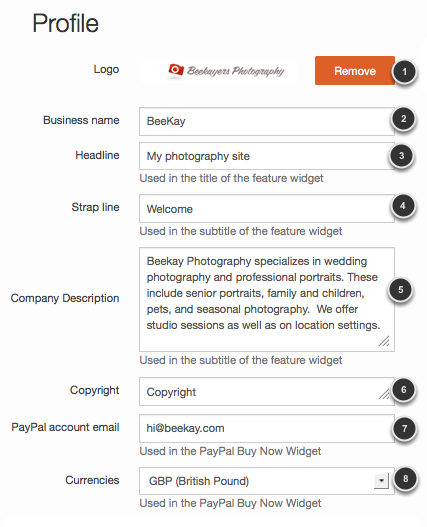 You also can do this manually within your site, but it will take you longer to do so. 1. If the template you chose has a logo, it'll be replaced with the logo you add here. 3. This headline will appear in the feature widget (below the navigation menu). 4. The strap line will appear below the headline in a smaller size. 5. If you add an 'About us' page to your site, the text you added here will be automatically placed on that page. 6. The copyright will appear in the footer of your site on all pages. 7. If you are going to add PayPal widgets, add here your paypal email. 8. Select the currency of your PayPal account. 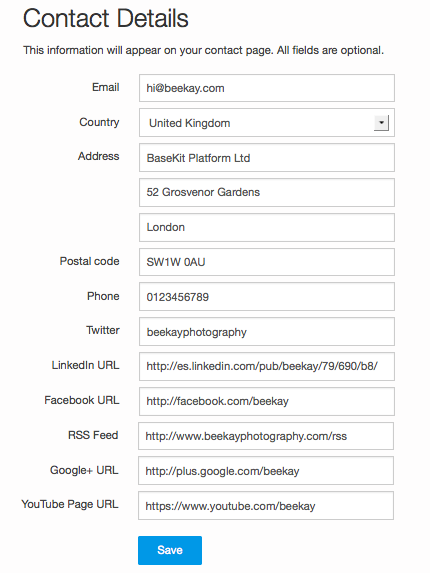 The information you add in your Contact Details will appear in the footer of your template if it's designed that way. In most templates you will be able to see in the footer the email, address and telephone, as well as a Twitter widget. If you add a 'Contact' page to your site, the information you add here will be added automatically to the Contact page.